It’s everyone’s nightmare to return home and find you’ve been burgled and all your precious belongings have been stolen. We hear about this on on a daily basis as a local locksmith in Edinburgh, and regardless of your properties location, we are all at risk. Without warning and within minutes you’ve lost everything that’s taken years to acquire. The difficult initial question when enquiring about a safe is where to start? There are many kinds of safes to choose from. I’ve detailed a few of the questions you should be asking before you take the plunge and purchase your new safe. What do you need to store in your safe? Your planning should always start with what exactly do you need to keep safe? Which possessions have the most value to you and your family. Put yourself in a worst case scenario of discovering you’ve been burgled. What lost possessions would upset you the most? Consider things that are irreplaceable and have memories for your family. Included in your research should be paper documents of value to you, such as birth certificates, passports, share certificates and property deeds. Also, consider insurance and vehicle documents that you need storing. Additional things to consider should be expensive items of jewellery and personal keepsakes such photos and recordings. Another area of the store could be medication for you and your family both for safe keeping and to keep away from children etc. What kind of safe would be best? 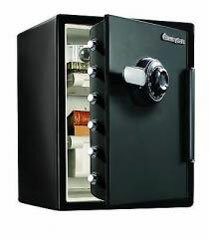 Fitted Wall Safes:When most people think of a safe they immediately think of wall safes like in countless movies. The main problem with this safe is that they can’t support to much weight. The primary purpose of wall safes is for storage of papers and important documents. Floor Standing Safes: These safes offer the most versatility but tend to be bulky and cumbersome. They’re ideal for storing heavy weight items and larger pieces. Dangerous Items: It is never a good idea to store weapons such as knifes and guns in either wall or floor safes that are in regular use. These such items should be stored in specially built safes that have extra security such as additional locks and stronger casings. You often might be better off buying two safes for different locations and items for storage. This has the bonus that is, is if they find one safe the other safe could be untouched. What size of safe do you require? Although it might seem elementary, always take the measurement before and after looking for safes. Safes by their very nature are heavy items and are always difficult to move. Once delivered to your house or business it is always best to install first time without the need to move again. Also, make sure you choose a safe that can accommodate all your possessions. The outside of the safe is pretty straight forward. Measure the height, width and depth of any safe and always consider the door opening space required to gain access quickly and easily. It’s always wise to measure where your safe is going to reside with plenty of room to spare. To calculate the inside measurements, collect everything that you’ve taken note of and roughly measure their height, width and depth. The majority of safe dimensions are given in cubic feet so you will need to convert to imperial measurements when working things out. Always try and buy as big a safe as possible for future proofing. Like everything, you get well-made safes and also less secure safes. Certain safes offer protection against fire but are lacking in lock security. Other safes are secure but come with a higher price tag. Before buying your safe think about what type of protection you need the most and whether you can afford to spend on this level of security. According to the most recent Which Reports, fire is the most common cause of asset loss, succeeded by buglary and then water damage. There are safes available that offer multiple attack protection. These safes are nown as composite safes. Like other safes these offer different levels of protection. What kind of budget you have can greatly affect the safe you’re going to buy. As with everything else you get what you pay for. Always keep in mind that bigger is not always better when choosing the right safe. Sometimes you have to comprimise and concentrate on a limited number of possesions you can secure. You can still purchase a relatively secure safe that can withstand numerous attacks for very little money. But be aware that higher quality steel and superior boltings come at a price. When purchasing a new safe there are always additional extras that you can put in place. Certain retailers include warranties on their safes which you can use to cover the cost of stolen possessions. Delivery costs are always to be considered so make sure you ask before you buy.